Saloni's team is amazing. Ours was a tam-bram style wedding. With very short time in between the function and rituals starting as early as dawn, they had setup their station quickly and ready to work upon us. They transformed my sister-the bride completely, all three days - 5 differnt functions. They had put all efforts to know our style of bridal look and draping, making us all look our best at the functions. They are a team of professionals very passionate about their work, I'll recommend them to everyone. She is a pro, the best thing I like about her is she keeps a check list about what client needs, she met each n every requirement of mine, the major was I wanted my base to be very natural and it should be according to my skin type as I have a super oily skin, which starts shining after an hour no matter how much you powder it and that is really tricky to handle, she managed everything wery well unlike other make up artists who paint your skin in different shades with coats n coats on and you end up feeling like a clown. I would totally recommend her ???? Saloni arora is a professional. I couldn't believe my eyes when I saw myself ready. She made me look so extraordinarily beautiful. She understands your skin tone, what would suit you . She is highly recommended if you want to look fab ..Thank you Saloni. 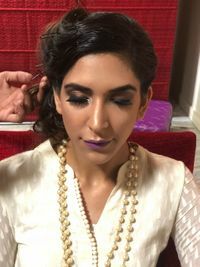 I got my makeup done last week from makeup mafia for a Diwali party . And I would love to recommend this place to all my friends as I just loved the magic they did it on me. Perfect shade of my skin, perfect eye makeup. I was flooded with compliments. Thank you so much makeup mafia for your flawless makeup. Keep up the good work.???? These people ruined the skin of the girls of Glamanand Supermodel India 2018. Imagine the state of mind of the girls who are competing to be Miss India. They ruined the brand image of the second biggest pageant company of India. Moreover, we came across money extortion done by these people forcefully. Saloni is a fabulous makeup artist.She enhances natural beauty with her make up and her team is a great support. Thanks Saloni and we meet again on upcoming function. It was a pleasure to be known with Makeup Mafia. Saloni and her team is completely dedicated and amazing with the work. Work is appreciated and recommended! Saloni is extremely talented professional and her team is also amazing in makeup. Saloni is really amazing artist , her level of patience during work is appreciable. Her makeup mafia team is outstanding. Make up for me should best simple sober and natural ,Saloni met my expectations and made ma event remember able. Saloni and her team made me a bride i dreamt to be! They are having a magic stick...I mean everyone who still looks at my wedding album asks the first question ..who was your makeup artist? She is helpful, talented and a beautiful soul who is ready to always help you out with whatever doubts you have in your mind... Thank you Saloni ...thank you makeup mafia team for being there on the best day of my life!! My experience with makeup mafia has been truly amazing. Saloni and her team are amazing people with extreme level of professionalism and knowledge about their work. I was amazed at Saloni’s knowledge about skin-types, various techniques of contouring etc. I really liked the fact that she doesn’t try to change or alter your features but she enhances and accentuate them. I got make up done for a party - the look was subtle and non-cakey but at the same time you could notice super blended and extremely professional make up. She is patient with her clients and listen to their needs and at the same time gives her expert advice. The head hairstylist is also very talented and professional. Thank you for such an amazing service. Highly recommend team Makeup mafia. Saloni and her team is amazing! You can just trust them blindly. Very subtle and amazing work. I have been calling her since 2012, and have not tried any other makeup artist. Have recommended to a few friends as well, and they too are her repeat clients. I would highly recommend her. Makeup was one thing I knew I didn't want to worry about. Makeup Mafia provided makeup for myself and to all my family at my brother's wedding. I couldn't have been happier with the results and I know everyone else was equally satisfied. she respectfully listens to your requests and moves throughout the getting ready period with a calm stress-free attitude.Our makeup looked great all night long with hardly a touchup. 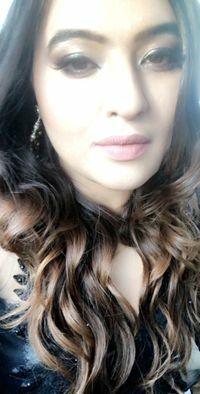 she is so talented at her craft and you can tell she really loves what she does.If you're thinking of booking saloni arora act quick before she gets booked. Makeup Mafia is literally the BEST. They made me look and feel gorgeous. Saloni has a wonderful eye for colors and respectfully listens to your requests. Her team was on time and ahead of schedule. They are really sweet and professional. I think they did a great job. I would highly recommend her. Keep going!! Saloni was a pleasure to work with. Having her do makeup at all my wedding ceremonies was one of the first (and best!) decisions I made while wedding planning. Makeup was one thing I knew I didn’t want to worry about on the day of the wedding, and it came out wonderfully. Saloni is a true professional, and has a passion for her work. If you’re thinking about hiring her, go for it – but book early because she is in demand! Highly recommended. Makeup Mafia & team just delivers the best service during the most important days of a girl's lives. It was Saloni who planned & gave me 9 new looks & hairstyles during the course of my wedding right from my rokka to the main day. In fact, during my pre-wedding shoot, Makeup Mafia team accompanied me & made sure that my looks are just picture-perfect at each moment. 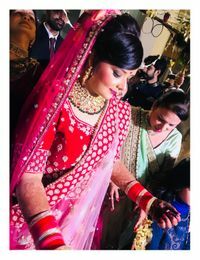 The professionalism of Saloni backed by her personal touch made me convinced that my mom & my sister will also get the best during my wedding and they did receive the best. The work was just flawless and very efficient. Despite of my wedding being a destination wedding, there was no hustle for me since the entire team was very professional & focused to make the clients happy. 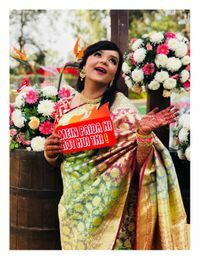 And yes, its indeed true because of Saloni & her Makeup mafia team, I cherish my wedding moments even more and not only me, everybody who came, all have asked me to share the number of MakuUp Mafia. You are going a long long way Makeup Mafia! Keep up the good & beautiful work!! Saloni and her team did a great job! Saloni is sweet and very easy to work with, she makes you feel comfortable instantly. The makeup and hair was exactly as we had discussed and lasted till the end for all my functions. She made me look flawless especially for my bridal look. I would definitely recommend Saloni and her team to all the future brides !!???????? Saloni Arora is amazing. She is talented, friendly and does her work extremely well. I had the pleasure of getting my makeup done by her and it was nothing short of flawless. She works efficiently and with great dedication. I highly recommend Saloni for any function. The result is sure to be beautiful! Well... what to say about Saloni Arora - this bold beauty with brains. She is not only a great makeup artist but a wonderful human being too. Professional to the core. She made me look like a princess on my best friends wedding. I would strongly recommend everyone to visit Makeup Mafia once and you will be amazed with the services. Thank you Saloni Arora for making me feel so beautiful and stylish. You are booked for my wedding. Keep doing the great work. Cheers !!!!! Beautiful makeup done on my wedding day.. It was perfect!!. Awesome service . I got my makeup and hair done by Makeup Mafia for my friend's wedding. They gave me a beautiful and really classy look for the function. Perfect for a day wedding. I really loved it. Thank you guys especially Saloni. 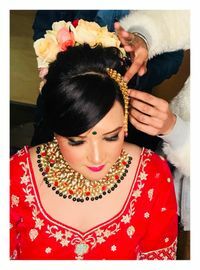 :* I would recommend them to everyone looking for a professional and experienced makeup artist for the upcoming wedding season.